Aries Heavy Duty Front Jeep Wrangler JK Bumper, fits 2007-2015 all models. Gear up for battle against the backcountry with Aries Replacement Jeep Bumpers. Easily installed right in place of those flimsy OEM bumpers, Aries bumpers tame the trails with aggressive style and stalwart functionality—unmatched by anything from the Jeep factory. Wrought from 3/16" solid-steel plating, stainless tubing and a heavy-duty black textured powdercoat, Aries bumpers are built for serious abuse. With cutouts for factory lights, mounts for auxiliary lights, wrap-around extensions and a 10,000 lb winch mount, your Jeep gets the trail-worthy protection you're looking for. And, the 6-piece modular design lets you configure your bumpers for your individual off-road needs. 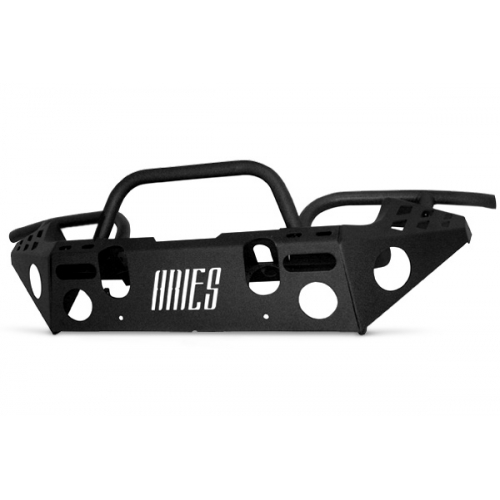 Aries bumpers come in both front and rear units, to bring the protection full circle. Plus, the front unit comes with your choice of a black bumper with black tubes or a black bumper with polished tubes. And best yet, Aries backs your Replacement Jeep Bumpers with a 3-year warranty.